Why front and rear bumper protection ? Car bumper protection is a cost effective way to protect your plastic bumpers from parking related bumps at parking garages. Can the BumperBlocker front and rear bumper protector be used outdoors ? The BumperBlocker car bumper protectors are covered in a hi-quality 100% cotton fabric that is water resistant, but not waterproof. Consequently, we do not recommend these bumper guards for outdoor parking. A light drizzle will not effect the product. However, moderate to heavy down pours will soak into the fabric. Regular use outdoors will shorten the products life span. Can I park on the street with a front bumper protector attached ? A front bumper protector may cover your front license plate. Some states prohibit covering of license plates when parking on the street. If you plan to use the product for street parking, please check your local and state laws before ordering a front and/or rear bumper guard. 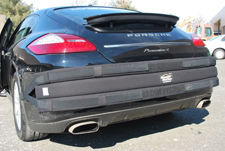 Will the BumperBlocker front and rear bumper protector fit every car ? Rear security straps do not stick to my trunk carpet ? Velcro straps may not work with all trunk carpets (sometimes a trunk mat covers the real carpet i.e. Lexus cars, Toyota etc.). Other options: (a) drop the straps inside the trunk and close the trunk lid. The weight of the lid will hold the straps in place. (b) Purchase additional Velcro tabs from a hardware store and attach to any hard surface inside the trunk. Straps can then attach here. Attachment instructions for front and rear bumper protection ? Can I drive my vehicle with the Bumper Blocker front or rear bumper guards attached ? Never drive and/or operate a vehicle with the BumperBlocker bumper guards attached. Product may come loose while driving and fly of the vehicle causing injury and vehicle damage. Will the car bumper guards protect my bumper in event of an accident ? Front and rear bumper protectors were designed for parking use only and may help protect the bumper finish only. 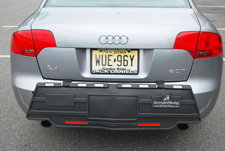 Front and rear bumper guards were not designed to protect a vehicle during a collision or accident. How are bumper guards shipped? Is expedited shipping available ? We ship via UPS ground. 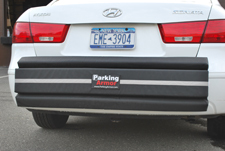 Bumper guards ordered within the tri-state area are usually delivered in 1-3 business days. Overnight shipping is not offered. If not satisfied with the purchase, you may return the product for a refund within 14 days of receipt, minus initial shipping cost. Buyer is responsible for return shipping. To return a product, please contact us for a Return Authorization # and instructions. Product must be returned in new / resellable condition. Damaged or dirty products will not be refunded. Q: I want a front bumper guard to compliment my luxury vehicle. Most front and rear bumper protectors are bulky contraptions that will ruin my car’s appearance. How is the BumpShox bumper protector different? A: The BumpShox car bumper protector was designed to have a stealthy appearance, so it will not ruin the appearance of your vehicle. It will not rust or bend out of shape like metal front and rear bumper guards and bumper protectors. Q: Why choose BumpShox front bumper guard over competing car bumper guards? A: The BumpShox car bumper protector is the best looking front bumper guard. Some value added features are (a)BumpShox bumper protector has no exposed metal parts. 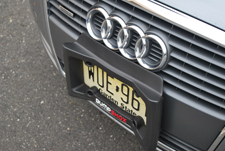 All mounting hardware is recessed (b) To attach the BumpShox car bumper protector simply replace your existing license plate frame with the BumpShox. (c) BumpShox bumper protector is made from a quality v-tech foam to absorb impacts. (d) BumpShox is wider, taller and thicker for maximum front car bumper protection. Q: Will the BumpShox front bumper guard protect my vehicle’s bumpers in an accident or collision? A: As with any bumper guard or bumper protector the BumpShox will not protect your vehicle’s bumpers in event of an accident or collision. When used as directed BumpShox may help protect your car bumpers finish from low impact parking bumps. Q: How does the BumpShox car bumper protector attach and what prevent someone from stealing it? A: The BumpShox front bumper guard was designed as a replacement license plate frame, so it will fit any front plate mount. Simply bolt the bumper guard in place using the exiting bolts and your done. For added security you can replace your OEM bolts with locking bolts. These can be purchased at any auto part store. Q: Is the BumpShox car bumper protector designed for the outdoors? A: The BumpShox car bumper guard was designed for outdoor use. BumpShox uses stainless steel washers that will not rust. 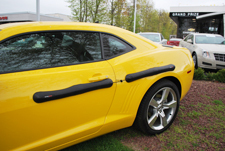 Our V-Tech foam will not crack or rust like metal car bumper guards. Q: I had a powder coated license plate frame that got chipped and started to rust out? Is this a problem with the Bumper Shox car bumper guard? A: This is not an issue with the BumpShox bumper protector. Special V-Tech foam will not crack, bend or rust like metal frames. Q: The metal license plate frame I bought bend out shape after a few weeks of use. Will this happen with the BumperShox car bumper guard? 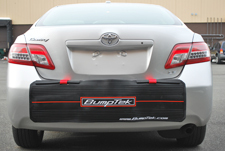 A: We designed the BumpShox car bumper protector out of V-Tech energy absorbing foam that’s tough. Upon impact the product will compress and return back to its original shape. Q: Will the BumpShox front bumper guard work with my OEM screws? A: The BumpShox bumper guard works with most existing mounting hardware. In some cases the OEM screws may be to short. If this is the case you may need to purchase longer bolts or screws. These can usually be purchased at your local hardware store. Q: Is the BumpShox car bumper guard street legal ? A: As with all novelty license plates you should always check your local municipality to determine whether product is street legal in your state, to avoid a ticket. Some municipalities are very strict and do not allow novelty plates on the front or rear bumpers. Q: Is BumpShox car bumper protector EZ Pass Compatible ? A: Bumper mounted EZ pass tags will not work with the BumpShox bumper protector. Q: If I do not like the BumpShox front bumper guard or change my mind, what is the return policy? A: If not completely satisfied with your BumpShox car bumper guard, you may return the product for a refund within 14 days of receipt, minus initial shipping cost. Buyer is responsible for return shipping. To return a product, please e-mail us to request an RMA# and return instructions. Product must be returned in new / resalable condition. Damaged or dirty products will not be refunded. Q: When will my bumper guard arrive? What shipping carrier do you use? A: Orders are usually processed the same or the following business day. We ship using UPS ground and U.S. Postal Service. Delivery time may vary depending on location. For NY and tri-state area 1-3 business days. Q: Will the Door Shox - Car Door Guards scratch my paint ? A: DoorShox car door protectors were designed so that the magnets never make direct contact with the door. For maximum protection the magnet feet are covered by a soft silicone like material with raised micro ribs. The raised ribs act like little feet to (a) minimize the contact area (b) provide cushioning and (c) help the product grip the vehicle better. * A properly maintained door guard will not scratch your paint. For best results, regularly clean the car door guard surface and the car door to remove dirt and debris. The rubber feet easily wipe clean with a tissue or wet wipe. Q: Can I drive with a DoorShox car door protector attached ? A: DoorShox car door guards were designed for a parked car. Never drive with car door protectors on your doors. Remove vehicle door protectors before driving. Q: Will the DoorShox car door guard attach to aluminum or fiberglass doors ? Q: Can the DoorShox vehicle door protector be used in rain or snow ? A: DoorShox car door protection was designed for outdoor use. Rain will not affect the magnet performance. Q: Can the DoorShox car door guards be stolen easily? A: No car door guard is 100% secure if the thief is determined. The car door guards come equipped with a vinyl covered steel cable that secures inside the vehicle to prevent theft. The suction cup holds the cable in place, so you can open and close the car door without the cable falling out. Q: What the difference between a "Valet" car door guard and a “Standard” car door guard? A: Valet car door protectors were designed specially for valet parking situations. Allows the parking garage attendant to open and close the vehicle door without having to remove the car door protector. Note: Perfect for 2 door coupes. Can also be used on a 4 door car. For more car door protection information, please watch the videos on the products page. A: Standard car door protectors offer maximum vehicle door protection for either 2 or 4 door vehicles. In this configuration two door guards are connected with a common cable and security tether. For additional vehicle door guard information, please see the video tutorial on the products page. Q: Can a "Valet" car door protector be used on a 4 door vehicle? A: Yes, a “Valet” vehicle door guard can be used on 4 door vehicles. Q: Will a "Standard" car door guard work on a 2 door vehicle ? A: "Standard" car door guards will work on 2 door vehicles. Simply place one door guard on the door and the other door guard on the rear fender. Q: How do I care for my car door guards ? A: Clean the car door protectors as needed to remove any dirt and debris. You can use a damp towel or wet napkin. Rubber feet will not trap dirt and are easy to clean. Q: I attached the front and rear car door guard ("Standard"kit), but cannot open the front door to insert the suction cup ? A: When you attach the "Standard" car door guard allow some slack in the connecting cable. The connecting cable can extend from 0 to 8 inches to fit different size vehicles. Q: The suction cup on my car door protector will not stick to the glass ? A: All car door protectors come standard with a security tether and suction cup. The suction cup holds the door guards security cable in place. If the suction cup falls off right away you may need to wet the suction cup or wipe the glass clean.